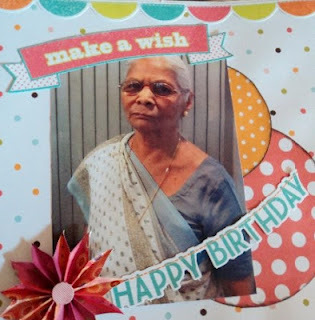 Life @ its Best: Scrapbook for Grandma's 80th Birthday..!! It indeed is a blessing to celebrate a life and celebrate God's goodness and faithfulness. It's not just the long life we celebrate but His love, mercies, blessings and overwhelming grace. My Grandma is a retired primary school teacher. Hundreds of students have studied under her and it is such a joy to invest into someones life. She has always inspired me, her love and energy with the kids at school and with kids at home too. I Guess me and my siblings were not very easy bunch of kids - we were trouble makers, hyper active and loud. But looking back at our childhood it is her we reminisce. My cousins were also the ones who were nurtured under her. And the most blessed is the one who is still being directed, nurtured and matured under her wing. Many times people question the meaning and point of life - I guess it is when you live till the end is when you find answers. Well, so my siblings and me decided to do something different to commemorate her, and the idea of making her a scrapbook came along. In our excitement and so on we didn't notice what materials we used and so on. We even forgot to take the pictures of the scrapbook we prepared :(. But I have this one picture of the title page I took which I would like to share with you all.... though it's not very complete.